Along with Adam Flynn, goalkeeper Tony jointly claimed the manager’s player of the season award at Burscough before following manager Liam Watson to Haig Avenue. A former youth and reserve team player at Preston North End, he joined the Linnets from Lancaster City in June 2006 after becoming a familiar name in the Conference North. Having moved from Preston to Wigan Athletic, he played under Liam Watson at Runcorn FC Halton, where he kept goal in over 200 matches after joining in 2001. Upon signing for the Sandgrounders he was handed the gloves ahead of Steven Drench and went on to play 240 games over a 5 year spell which included lifting the Conference North title. Since leaving Haig Avenue in 2013 he had a short spell with Altrincham before joining Barrow with whom he spent a further 3.5 years. 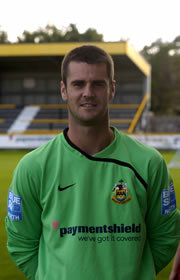 Tony is now playing his trade for Warrington Town under former Southport manager Paul Carden.